What couple doesn’t know that you can learn much about your relationship through travel “experiences.” We learned early on that we did well together on this front, with M. managing the driving aspect of things and me taking on the navigatrix role. We have navigated many a back road sans GPS, but Cyprus has presented us with an, ahem, wonderful challenge. Karagöz howls with glee at my admission to this truth. “I begged the Gods for some good old-fashioned chaos on this trip!” He cackles as he rubs his hands together briskly before Hacivad Bey yanks him off of the table and kicks him down the beach a ways. I watched him fly about like the calfskin tumbleweed he is until he faded into the sunset of the Altin Plajı (Golden beach) way far East on the Karpaz penninsula which points like a finger to the chaos on the Turkish-Syrian border across the Ak Deniz (Mediterranean Sea). It is as hard to imagine what is going on there tonight as it is easy to imagine Aphrodite’s birth right here in this bay. And with that statement, there was silence, so I turn back to you, reader. After the short flight from Istanbul to the Turkish Republic of Northern Cyprus (TRNC), we exited the plane despite the insane bum-rush-crush of folks piling to the front of the plane as soon as it touched down and hadn’t even stopped rolling along. Although many were in winter coats, it was a balmy 75F at 9 pm. Remember, folks, it’s November! We had & now knew that we were renting a car from this place – they had us. And tabi canım, (of course dear), they couldn’t meet the price of our reservation and we paid more. Taking the whole thing in stride, we thanked the lucky stars that at least we hadn’t given our credit card to the scammers – and giggled gleefully about what a well executed scam this was on the part of Sun Car Rentals. 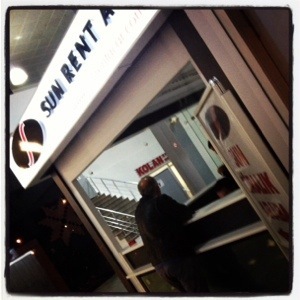 It had to be Sun Car Rentals that came up with the scam – who else is to benefit if no credit card is involved? In the absence of North Cyprus Car Hire, all of the business gets funneled to the reigning monopoly. We cut another notch in our collective belt of travel experiences and drove out of the lot – Brit style, on the left side of the road – and by “we” I mean M., who took to it like a fish to water. Now I was on deck, charged with getting us to a gas station as the car was empty (hah!) and then on to the mountain village of Bellpais (Greek name) or Beylerbeyi (Turkish name) in the Girne (Turkish name) or Kyrenia (Greek name) province. Immediately, I noticed that despite a decent level of detail, our map had no highway numbers. Lighting on the highway itself was spotty and it was a moonless, pitch-black night – and we seemed to be driving through the buffer area around the famous “green line” that separates Northern Cyprus from southern Cyprus, where Greek is spoken. Add to this that the directions we had from the hotel might as well have been written in Old Church Slavonic give where they were taking us, I began to realize it could very well be a night of dead reckoning at best. Crumbling the old Church Slavonic directions with fervor, I accidentally knocked a few of the Karagöz puppet troupe off of the back window ledge as I tossed them out of sight. Mumbling my apologies to my dear puppets, I began to study the map and piece things together. Being the navigatrix, I quickly re-routed us towards Bellpais. As we drove on through the dark, we began to realize the nature of Cyprus – a struggling country, we surmised. M. told me about the stories he has heard about how the South side of the island controls the electricity for all of the north (ah – thus the driving in the dark here and there). Apparently, this goes on mostly in summer, to harm the TRNC’s tourist economy. But more on geopolitics another day. We were too busy being happy and in love at the prospect of solving our travel conundrum together sans cep telefonu (mobile phone). After driving too far, engaging in harrowing turns and spluttering with both giggles and a bit of anxiety at one another over the next two hours, we finally found what on the map clearly had to be the road for Bellpais – which soon led past a large Turkish military camp to a dead end. Not seeing any place to ask directions, I suggested that I go up to the military gate and ask the solider on duty – the only human around. Well, you know how it is about the stereotype about some people asking directions and some people not liking to ask, but M. surprised me, saying “Are you crazy, I won’t let my wife do that – talking to them is dangerous – and for a woman that is dangerous, I will do it. Don’t call me sexist in your blog because I said that.” Giggling, I demurred whilst also remembering M.’s great fear of going near any Turkish military compound – something I have always thought paranoid or post-military-PTSD related in his case. But I soon learned to respect his fear on this matter. As M. pulled the car up to the gate – not too close – we saw the soldier at the front cocked his automatic machine gun. I gulped, and I could feel M.’s anxiety well up. It was past 11 at night and it was just plain spooky. Clearly, M was desperate enough to get us to the hotel safely to be willing to ask for directions. Opening the car door slightly, he called out “Kolay gelsin, abi!” (May your work be well, big brother – a common greeting that shows respect. He then went on to ask permission to exit the car in order to come up and ask for directions, which surprised me, and was told to stay where he was and not get out of the car. I saw two other soldiers rush to the front gate. It felt surreal. I heard the puppets engaging in the duck and cover position, and I realized that my “always ask the policeman/soldier for help American naïveté” was blindingly stupid. “You need to get away from here,” the soldier, gun very much at the ready, said, “this is a sensitive area.” Although I couldn’t understand much of the Turkish wording, the tone was abundantly clear. “Go back on the highway and approach Bellpais from the other side of the mountain.” Needless to say, we got out of there as fast as we could, M. mumbling along about never, ever, ever stopping at a military base again. “You don’t realize sweetheart, you don’t understand, I left Turkey because you could full well die over something as dumb as asking directions – I shouldn’t have done it, shouldn’t have done it!” M. went on to explain that still, after 40 years, the Turkish military in the TRNC is still on high alert for incursions from the south – or suicide bombers from Kurdish political groups…so it was no wonder this happened. I hit an emotional pothole when trying to make him feel better by pointing out that one silver linings of the loss of my Dad 1.5 years ago is that M. Didn’t need to live in fear of explaining what had happened to me if something went wrong like he used to. This was met with an eye roll and a reminder that it wouldn’t be easy to tell my Mom either, assuming he survived the soldiers bullets. Further, Kenne, the Queen of Etiquette puppet began poking me in the ribs at the senseless stupidity of this comment. I quickly steered the conversation out of that bad direction by regaling M. with details about the famous writer from Bellpais, Lawrence Durrell, as we continued on single lane, dark, windy roads. Kenne still muttered in a disapproving tone in the backseat of the car as her maidservant, Zenne, fanned her furiously. Still lost as all get out, we eventually found help from a family whose lights were on…they could not have been more gracious about our late night visit. One of their sons had studied in Richmond, Virginina. As they only spoke Turkish, M.took in the long explanation about how to get to Bellpais – which as navigatrix I knew he would never remember, but it at least got us started in the right direction. In the end, we found the Bellpais Monastery Village Hotel with only two more directions-referral stops, and sunk into our couch to watch the news on Al Jazeera with a shared can of well-earned Efes beer and a fit of the giggles that saved the day. So remember, soldiers may not be the best choice to seek help from when lost in Turkey or the TRNC. Allah, hallah (said when highlighting a big sad, bad, surprising or funny point) it’s a sad world sometimes, thank goodness for having a partner to giggle out the anxiety with at the end of the day! This entry was posted in Cross-cultural learning moments, Puppets on the move around the world, Turkish Controversies, Visits from the Karagöz puppets and tagged Cyprus, driving, TRNC. Bookmark the permalink. Ah yes, the Turkish military. The boys with their deadly toys strut their stuff outside the small barracks in the middle of Bodrum Town with their serious faces on. Nobody dares go near them even though the only thing going on inside is copious amounts of tea drinking! So glad you are “enjoying” yourselves! It’s got to put into a particular kind of relief certain public policy talks over here. . . consider yourself lucky – my old mob would have had you wired by your thumbs to the wall! How the world needs to change . .
Oi! Figured as much from what you’ve shared. M really can’t believe that he broke normal protocol and did that…but all’s well that ends well! You’ve got that right – perspective. Enjoyment is good but pain is nagging but I’d rather be here than almost anywhere – it’s been so long since I’ve seen m sparkle so.